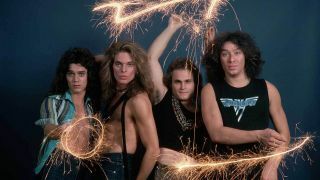 When the debut album by Van Halen was released in early 1978, it was a bolt from the blue. For the older generation of guitarists, still in thrall to the likes of Hendrix, Clapton and Page, it was something entirely new. Eddie Van Halen’s playing a was a paradigm shift away from the blues rock template musicians had followed for a decade, and a step towards something altogether more futuristic. And for those musicians picking up the guitar for the first time, Van Halen was a dazzling, technicolour leap into the unknown, a different kind of template altogether. Below, some of the world’s great guitarists reflect on the impact of Van Halen’s first album. “All through junior high school, when kids heard me play guitar, they asked if I could tap like Eddie. I didn’t know what they were talking about. One day my dad brought home a cassette tape that he had found in the gutter; it was this album. I was excited to hear what the hubbub was about. I instantly fell in love with everything about the music, especially the guitar. I started trying to learn Eruption, like most of us guitar nerds did. “When I heard the sound of Eddie’s guitar, just the pure sound he made, it was magical. I never knew a guitar could sound like that. It just kind of reached out and grabbed me like nothing else had before. “For me what I always loved in a record was a mix of the guitar work but also great work from the whole band. But, I think from a guitar sound perspective Van Halen affected me a bunch of times. Van Halen’s first album was big for me. That showed me the kinds of sounds you could get out of an amp. “It has great playing but also amazing tone. That album was a breakthrough for me and for a lot of people from my generation. That wasn’t the first guitar album that I loved but it was so important in terms of tone. “This album is just unfair to everyone. Eddie’s innate musical genius ears, combined with the athletic prowess he got from eight-hours-a-day bedroom practicing, along with an indestructible rhythmic groove developed from jamming with his brother, results in a record of non-stop jaw-dropping awesomeness. “When I began taking electric guitar lessons at the age of 13, the first thing my teacher got me to do was Black Dog from Led Zeppelin. But after that, he taught me what Eddie Van Halen was doing on this album. Now, that was in about 1985, so the album was several years old by then. But, it was all new to me. Of course, a lot of guitarists were already aware of the stuff on this album, but for me it was a revelation. “Like a super-charged Camaro that screams by you on the road, here’s a musician that took lead guitar to another level. You can hear the influences of the British players I love so much, but it’s all done with power and grace, with flash and fireworks off his hand built stripped guitars. “This changed everything – for me and for everybody. What amazes me still is the economy of the sound and the minimalism of the arrangements. As incredible as Eddie’s playing is, he doesn’t pile on all kinds of needless stuff. It all sounds like one guitar performance throughout. Nothing is doubled or tripled. If you listen to this record on headphones, there’s one guitar and it’s only on one side, and it still sounds massive. “Nobody had ever heard something like this. It was completely groundbreaking. I was at a school for creative kids in Vermont, and one of the kids there had the Van Halen record. I checked it out, and I stole it from him – it’s one of the only things I ever stole. I feel bad now, but there was no way I was gonna give this back. Forget it. “I listened to it every day and thought it was amazing, but I wasn’t really influenced by it – not really, I don’t think. I got the idea of tapping from Eddie, but I couldn’t do it like him. I tried learning Eruption, but I just couldn’t do it justice. “It’s one of the most important albums in the world of guitar. Very few things changed the landscape of guitar playing like the first Van Halen album. I remember my guitar teacher brought it over, and it absolutely shocked me. The sound, the spirit and, of course, Eddie’s complete mastery of the instrument – it blew my mind. “I first heard this record when I was eight or so. My aunt was playing a cassette of it at a party, and so what I do? I stole it! I just took it right out of the tape player. I didn’t have the cover, so I made my own artwork and stuck it inside an empty case. I think I drew a picture of a hot guitar or something. “Oh. My. God. When this came out, nobody – and I mean nobody - had ever done what Eddie Van Halen did here! At the time I heard the album, I was into jazzy stuff, but what he did was mind-boggling. It was a new style of guitar playing. When he launches into a solo you go ‘How does he think like that? !’ It’s like he just grabs the neck and tries to choke this expression out of it. And the tone, the whole brown sound thing, there’s nothing like it. As I think some other players I’m friends with, like Doug Aldrich or Richie Faulkner from Judas Priest, would say… we’re all still trying to get that sound. It’s a cascading sound, and Eddie wrote the book on that. There were virtuosos before him but they seemed to come more from jazz or fusion or places like that.